Machaca con huevo, Machacado con huevo or Huevos con machaca, is a dish which consists of shredded dry beef that is scrambled with eggs. Its name means "shredded with eggs" in Spanish. The shredded dry beef, carne seca or "machaca", is said to have originated in the town of Ciénega de Flores, about an hour north of Monterrey, Mexico. The early settlers in the area air-cured beef so that it would be preserved. According to one legend, the dish was invented in the 1920s by Fidencia Quiroga, who was known locally as "Tía Lencha" (Aunt Lencha). Although there may not be much evidence that she had actually invented the dish, there is much evidence that she had popularized the dish when she began to serve the dish in her restaurant to hungry construction workers who were building the nearby Monterrey-Nuevo Laredo highway in 1928. As a result of the great popularity of this dish, a major manufacturer of the shredded dried beef that is used in this dish is named after her, Productos Alimenticios Tia Lencha SA. 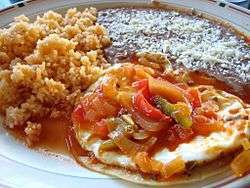 This is a traditional dish in the northern Mexican state of Nuevo León that is usually eaten at breakfast but could be eaten at other meals as well. 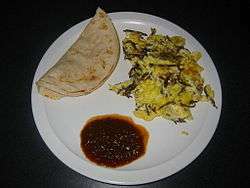 In the United States, this breakfast or brunch dish is very popular in Texas. The basic machacado con huevo is made with eggs and dried beef. Chopped tomatoes, onions and jalapeños or serrano chili peppers can be added, or salsa can be cooked into it, to create another version. 1 2 Adame, Homero (3 November 2013). "El origen del machacado con huevo" [The origin of machacado con huevo]. Mitos y leyendas de Homero Adame (in Spanish). ↑ "Machacado con huevo, una tradición muy regia" [Machacado con huevo, a royal tradition]. Telemundo 52 (in Spanish). 9 April 2014. 1 2 Meesey, Chris (25 November 2009). "On The Range: Machacado Con Huevos". Dallas Observer. ↑ "Latino Recipes For The Holidays: Machaca Con Huevos". Huffington Post. 26 December 2013. ↑ Kennedy, Diana (1986). The Cuisines of Mexico. Harper & Row. pp. 244–245. ISBN 9780061814815. ↑ Chavez, Stephen; Rodriguez, Art (December 26, 2013). "Latino Recipes For The Holidays: Machaca Con Huevos". Huffington Post. 1 2 Walsh, Robb (1 February 2010). "Machacado con Huevos". Houston Press. ↑ Guerrero Aguilar, Antonio (1 March 2012). "La tía Lencha y el machacado con huevo" [Aunt Lencha and machacado con huevo]. SabinasHidalgo.net (in Spanish). 1 2 Torres, Armando (22 March 2012). "Tía Lencha ampliará su mercado de exportación" [Tía Lencha expand its export market]. El Economista (in Spanish). ↑ "Nuestra Historia". Tía Lencha (in Spanish). ↑ Chavez, Stephen (August 19, 2014). "A breakfast of machaca con huevos". Alhambra Source. ↑ Shilcutt, Katharine (8 February 2012). "Morning Machaca: This tiny East End restaurant — attached to a dried-beef factory — serves tasty, old-school Tex-Mex classics". Houston Press.